Josh Wiggins has been on my radar thanks to his performance in the first rate 2016 feature Mean Dreams (which starred late actor Bill Paxton). 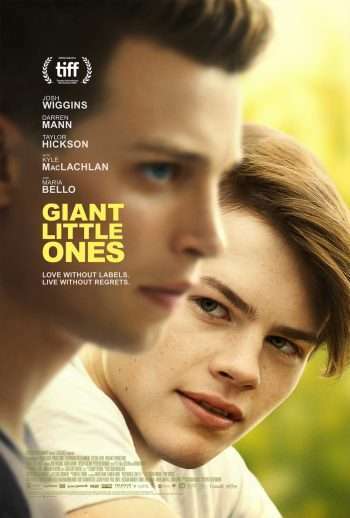 Wiggins co-stars with Darren Mann (Chilling Adventures of Sabrina) in Giant Little Ones, a coming of age drama that has was nominated last year for a People’s Choice Award at the Toronto Film Festival. The narrative centers on Franky Winter (Wiggins) and Ballas Kohn (Mann), best friends since childhood who are both on the swim team. After an intimate night during Franky’s 17th birthday party puts a strain on their friendship, Franky must navigate high school after being ostracized by his classmates. Ultimately he finds a potential kinship with Ballas’ sister Natasha (Taylor Hickson). Kyle MacLachlan co-stars as Franky’s estranged father, and Maria Bello, who executive produced the feature, plays Franky’s mom. Giant Little Ones opens in New York March 1 and goes wider the following week. Check out the trailer and tell us what you think!